The Congressional Clerkship Coalition is a national network of lawyers, law students, law deans and law professors, and lawmakers, working to create a congressional companion to the judicial clerkship program. We span the political spectrum. We come from many points within the legal community. We have in common deep investment in the Legislative Branch of government, constitutional separation of powers, and in enhancing the legal profession's appreciation and expertise regarding legislation. Larry Kramer, then Dean of Stanford Law, in 2005 drafted and circulated for signature the first Law Deans Letter to Congress urging the creation of a congressional clerkship program. The letter garnered signatures from the deans of more than 120 law schools. An updated Law Deans Letter, posted below, was sent to Congress in 2012. In 2008 and again in 2010, Professor Dakota Rudesill laid out a full case for the program in the Washington University Law Review. These publications provided empirical evidence showing a legislative experience gap: a dramatic relative lack of legislative work experience among the legal profession’s most powerful and influential ranks, compared to work experience in courts, federal agencies, private practice, and academe. Rudesill urged the creation of a congressional clerkship program as a first step toward infusing greater firsthand knowledge of Congress and legislation into the legal profession's most influential ranks. Rudesill, with Professor Abbe Gluck of Yale Law School, in 2016 emphasized these points, and also explained how routing the profession's future leaders through legislative experiences will work to span the court-Congress divide, and better inform courts about the legislation they interpret. Kramer, Rudesill, and Gluck have built upon influential scholarship by Robin West, Victoria Nourse, and others. Review a sample of their works in the Reading Room below. In 2012, three dozen prominent members of the legal community wrote to Congress urging creation of a congressional clerkship program. This Legal Luminaries Letter is available below. It was signed by law professors and lawyers spanning the political spectrum, including White House counsels for Presidents Reagan, Bush, and Clinton. Kramer's and Rudesill's work built upon and has resonated with influential scholarship by Robin West, Victoria Nourse, and others. Review a sample of their works in the Reading Room below. In recent years, more than 450 law students and recent law graduates from around the country have signed our National Petition to Congress, urging creation of a congressional clerkship program. Law students at Georgetown and Ohio State trained by Professor Rudesill have had a central and decisive role in our legislative advocacy campaign. Law students have done crucial legislative and programmatic research; advised the Coalition (their client) at every stage; worked on the bill's text; drafted many of our advocacy documents (including the Legal Luminaries Letter below, our National Petition, and the 2012 Law Deans Letter); and represented the Coalition in innumerable calls, emails, and in-person "pitch meetings" with Members and staff on Capitol Hill. They have done real legislative lawyering at the highest levels -- and gotten real results. The majority of our bill's cosponsors over the years were at some point pitched at the Member or staff level by one of our law student legislative lawyers. Discussion among Members, staff, and supporters led to introduction of a bill in the 110th Congress that would create an initial pilot program featuring six clerk positions in each chamber. The bipartisan bill, the Daniel Webster Congressional Clerkship Act, was sponsored by Reps. Zoe Lofgren (D-CA) and Dan Lungren (R-CA) in the House (H.R. 6475), and by Sens. Chuck Schumer (D-NY) and Hillary Rodham Clinton (D-NY) in the Senate (S. 3533). The House bill was approved by voice vote in late 2008. It was nearly cleared for passage in the Senate by unanimous consent (UC), but was held up for Senate process reasons unrelated to the merits of the bill. The 111th Congress saw a similar legislative trajectory. The bill was introduced by Reps. Lofgren and Lungren in the House as H.R. 151 and by Sens. Schumer, Clinton, and Ted Kennedy (D-MA) in the Senate as S. 27. Senators Kent Conrad (D-ND) and Byron Dorgan (D-ND) joined as co-sponsors. The House bill was passed by a resounding bipartisan vote of 381-42. Senate process complications again impeded its passage. Reps. Lungren and Lofgren announced re-introduction of the bill in the 112th Congress in April 2011 at a joint Stanford-Georgetown conference on legislative clerkships. Student lawyers nearly secured passage of a version of the bill as Congress considered "fiscal cliff" legislation in the waning days of the 112th Congress. In the 113th Congress, the bill was re-introduced as S. 1458 in August 2013 by Sen. John Hoeven (R-ND), Ranking Member of the Senate Appropriations Legislative Branch Subcommittee, and Sen. Patrick Leahy (D-VT), Chairman of the Senate Judiciary Committee. In the 114th Congress, on Dec. 5, 2016, Senators Mike Lee (R-UT) and Patrick Leahy (D-VT) introduced the Daniel Webster Congressional Clerkship Act, as S. 3499. They were joined by Senators John Hoeven (R-ND) and Ted Cruz (R-TX) as original cosponsors. Our press release with the four Senators is here. National Petition - The Coalition is partnering with leaders of American Constitution Society, Federalist Society, Law Democrats, Law Republicans, and Student Bar Association chapters nationwide to circulate a petition to Congress from law students and recent law graduates. We have already received the support of organizations including the Georgetown Law Student Bar Association, Villanova Law Democrats, the University of Wisconsin Student Bar Association, and the University of Chicago Law Students Association, among others. Click the "Sign the National Petition" tab above to sign the petition. Please share the link with interested colleagues and friends. Cosponsorship Drive - The Coalition is working to add Republican and Democratic cosponsors to the bipartisan bill in the Senate and House. Members and staff take mail from constituents and contacts seriously. So please make your voice heard. Click the "Write to Congress" tab above to learn more. 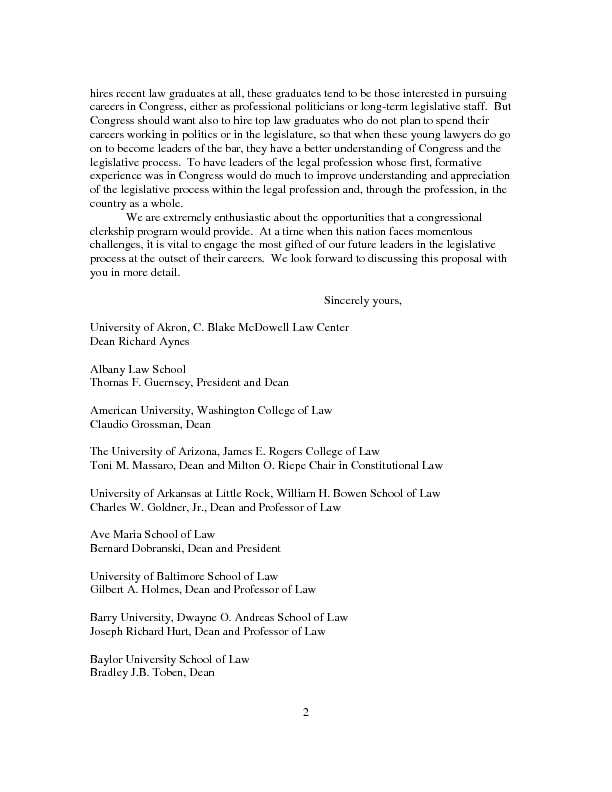 Following is the 2012 Law Deans Letter to Congress, signed by the deans of over 120 law schools. The congressional clerkship initiative is informed by a deep base of research and scholarship regarding legislative lawyering and legislative solutions to problems of law and policy. Below is a selection of relevant works. Introducing the Congressional Clerkship, Balkinization, Dec. 8, 2016, https://balkin.blogspot.com/2016/12/introducing-congressional-clerkship.html (with Abbe Gluck). Closing the Legislative Experience Gap: How a Legislative Law Clerk Program Will Benefit the Legal Profession and Congress, 87 Wash. U. L. Rev. 699 (2010), available at http://papers.ssrn.com/sol3/papers.cfm?abstract_id=1544947. Keepers of the U.S. Code: The Case for a Congressional Clerkship Program, Wash. U. L. Rev. Slip Opinions, Nov. 5, 2008 (online), http://papers.ssrn.com/sol3/papers.cfm?abstract_id=1273943. Ennobling Politics, in Law & Democracy in the Empire of Force (H. Jefferson Powell & James Boyd White eds., 2009), available at http://papers.ssrn.com/sol3/papers.cfm?abstract_id=1172204. A Response to Goodwin Liu, 116 Yale L.J. 157 (2006) (Pocket Part), available at http://papers.ssrn.com/sol3/papers.cfm?abstract_id=1830502. The Constitution's Political Deficit, 1 Harv. L. & Pol’y Rev., Dec. 4, 2006 (online), http://hlpronline.com/2006/12/the-constitutions-political-deficit/. 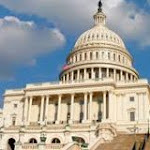 The Missing Jurisprudence of the Legislated Constitution, in The Constitution in 2020, at 79 (Jack M. Balkin & Reva B. Siegel eds., 2009), available at http://papers.ssrn.com/sol3/papers.cfm?abstract_id=1830546. Introducing the Congressional Clerkship, Balkinization, Dec. 8, 2016, https://balkin.blogspot.com/2016/12/introducing-congressional-clerkship.html (with Dakota Rudesill). Statutory Interpretation from the Inside -- An Empirical Study of Congressional Drafting, Delegation, and the Canons, Part I, 65 Stan. L. Rev. 901 (2013), https://www.stanfordlawreview.org/print/article/statutory-interpretation-from-the-inside-an-empirical-study-of-congressional-drafting-delegation-and-the-canons-part-i/ (with Lisa Shultz Bressman). Statutory Interpretation from the Inside -- An Empirical Study of Congressional Drafting, Delegation, and the Canons, Part II, 66 Stan. L. Rev. 725 (2013), https://www.stanfordlawreview.org/print/article/statutory-interpretation-from-the-inside-an-empirical-study-of-congressional-drafting-delegation-and-the-canons-part-ii/ (with Lisa Schultz Bressman). Unorthodox Lawmaking, Unorthodox Rulemaking, 115 Colum. L. Rev. 1789 (2015), https://papers.ssrn.com/sol3/papers.cfm?abstract_id=2699993 (with Anne Joseph O'Connell & Rosa Po). Misunderstanding Congress: Statutory Interpretation, the Supermajoritarian Difficulty, and the Separation of Powers, 99 Geo. L.J. 1119 (2011), available at http://www.georgetownlawjournal.com/issues/pdf/99-4/Nourse.PDF. The Art of Legislative Lawyering and the Six Circles Theory of Advocacy, 34 McGeorge L. Rev. 785 (2003), available at http://www.law.georgetown.edu/archiveada/documents/Feldblum-ArtofLegLawyeringand6CirclesofAdvocacy_000.pdf. Following is the text of the 2012 Legal Luminaries Letter to Congress, signed by three dozen leaders of the legal community. Representing leaders in the law in academe, private and public interest practice, the nation’s legislature, the federal executive branch, and on the bench, we write to urge Congress to pass legislation to create a congressional clerkship program analogous to the highly successful and influential judicial clerkship program. Each year the top graduates from law schools throughout the country begin their legal careers as judicial law clerks. These clerks rapidly learn the ropes and, for relatively low cost, provide valuable assistance as they learn about judicial decisionmaking and law practice on the job. Court clerkships are profoundly influential on the legal perspective of young lawyers who go on to leadership positions in the law and American society. Similarly, executive branch agencies have “Honors” programs, which give new lawyers in their apprenticeship years an inside understanding of administrative law and policy. It is unfortunate that Congress, alone among the three co-equal federal branches, lacks such a program. The Constitution gives Congress primary placement in Article I, through bi-annual elections makes it the most accountable to the people, and via vesting it with the legislative power establishes Congress as our foremost federal lawmaking institution. Today, the U.S. Code that Congress writes constitutes the majority of federal law and provides the foundation for administrative and regulatory law. Interpreting and applying statutory law is, accordingly, the bread and butter of federal legal practice, the majority of the Supreme Court’s docket in recent years, and an experience which virtually all lawyers will have in their careers. The legislative process and statutory interpretation are complex, but today we are not educating and training new lawyers for the law they will practice. Most law school curricula emphasize substantive law, judicial processes, and to an increasing degree, executive branch regulatory activities. Many students graduate with only a superficial understanding of the legislative process. Similarly, the government job placement efforts of most law schools emphasize judicial clerkships and jobs with administrative agencies. A major cause of this imbalance is the lack of post-graduate apprenticeship opportunities with legislatures that are designed for new lawyers and recruit on the same fall schedule as judges, agencies, and large law firms. At the federal level, Congress could begin to solve this problem by creating a congressional clerkship program. Legislative clerkships offer practical benefits to each of the key actors in the training of lawyers, the practice of law, and lawmaking. Recent law graduates would benefit most immediately: for the first time, they would have ready access to a year of intensive legislative experience inside the institution that writes the federal statutes that they will rely on in practice. The law firms, judges, administrative agencies, legislative offices, and law faculties that hire former legislative clerks would also benefit from their experience. Meanwhile, with a consistent flow of graduates heading off to legislative clerkships, law schools likely would find increased student interest in the legislation courses many law schools have added to their curricula in recent years. Finally, Congress would come to appreciate the consistent availability, energy, and insight of legally trained, relatively inexpensive law clerks. We have noted the constitutional importance of Congress and legislation. Consider also the effect on the American legal profession of Congress ceding post-graduate apprenticeship to the courts and the executive branch: over the years, it has contributed to a dramatically lower incidence of legislative work experience within the profession’s most influential ranks. That, in turn, has likely contributed to the generational slide in appreciation for Congress’s constitutional role compared to the roles of the judiciary and executive branch. Over time, a congressional clerkship program could begin to ameliorate this imbalance. The 112th Congress should capitalize on growing momentum behind this initiative. During both of the last two Congresses, the U.S. House of Representatives passed the Daniel Webster Congressional Clerkship Act, the second time by the overwhelming bipartisan vote of 381-42. H.R. 1374 would create a pilot program of 12 year-long law clerk positions, equally divided between the two chambers and between Democratic and Republican offices. The program would pay Congress’s clerks the same as U.S. district court clerks, and hire on the same fall schedule. The estimated yearly cost is about $1 million, a figure smaller than the cost of the Supreme Court clerkship program and well worth the investment in Congress’s constitutional standing. At a time when our nation faces so many challenges with legal – and particularly legislative – elements, more than ever our nation needs the assistance of able lawyers and the full engagement of the Congress. Creation of a congressional clerkship program represents a bipartisan, farsighted investment in a new generation of lawyers who will more fully understand the statutory law our profession teaches, practices, amends, administers, and interprets.